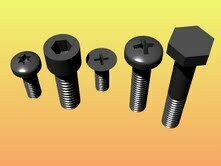 BoltGen creates accurate Metric and English machine bolts of any length. This plug-in makes Sockethead Capscrews, Flat head Machine screws, Flat head Capscrews, Pan heads, and Hex Heads, or just threads without heads if desired. Head drives include Torx, Philips, Allen Hex and Hex wrench. Download, unzip, and place in Rhinoceros Plugin Folder. In Rhino, choose Tools, Options, PlugIns, and Install BoltGen. Rhino command is BoltGen. More Rhino utilities from McVan Aerospace . . . When i choos metric i dont get the head data, please help. When i choos metric i dont get the head data. In BoltGen there are a few thread sizes that I could not find head data for, so the bolts are created as threads only. Try using a standard thread size. Or if you absolutely need a head on the threads-only creation, you can create the next size bolt with a head, cut the threads off leaving the head, and Boolean-union with the threads to create a complete bolt. Note that the head size may be a bit off from what you expect, but can be re-scaled before the Boolean Union. It should be noted that BoltGen v1.64 supports the AN specifications (that would be the Air Force / Navy numbering system for hardware) so you can enter like AN4H-16 and get the correct bolt complete with drilled head and shank. The developer was very responsive to request and added this feature very quickly. Send them beer money is the best way to get special treatment! BoltGen v1.64 supports AN standardized bolts, thank you very much Ray! Everyone needs to send Ray beer money! So easy to use, such great results. Thank you Ray McKaig of McVan Aerospace for making this available for free.